In 2013, a multi-day cloudburst in Uttarakhand caused devastating floods, killing more than 5,000 people. A year later, Kashmir suffered disastrous deluge due to torrential rainfall. Thousands were displaced and more than 500 people were killed on both sides of Kashmir. At the end of 2015, Chennai had its brush with an equally catastrophic flood that paralysed the city. 2016 saw Assam and Madhya Pradesh grapple with the reality that floods of massive intensity have become the new normal for India. While it is convenient to push the blame to extreme weather events for unprecedented rains, but not all of it is of nature’s doing. For instance, rains could cause so much havoc in Uttarakhand because the state had already witnessed indiscriminate developmental activities carried out in the ecologically fragile regions of the state. 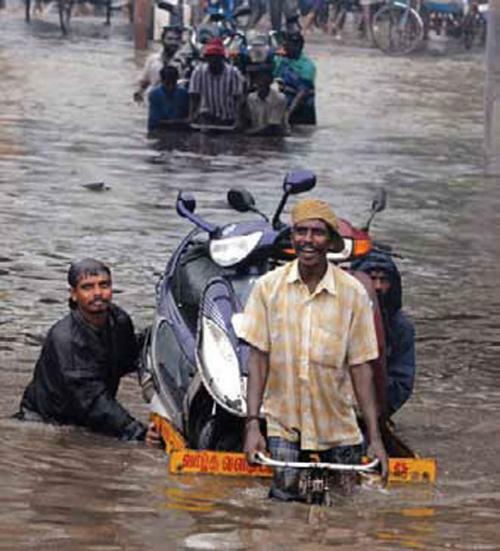 Chennai, which is no stranger to cyclonic storms and heavy rains, especially during the annual northeast monsoon in November–December, saw the worst flood in its history. In its bid to expand, the city has been encroaching upon its rivers, sacrificing wetlands to accommodate development and eating into the marshlands for developing public infrastructure. On this note, let’s take a look at the reasons pushing urban floods and the price we are paying for not reading the signs. The memories of unprecedented floods in Mumbai, Srinagar and Chennai are still fresh. 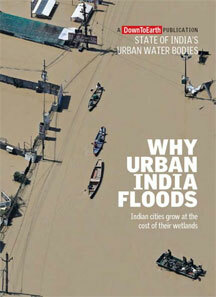 Ignored as sporadic or once-in-a-while event, urban floods have become regular, and increasingly devastating. 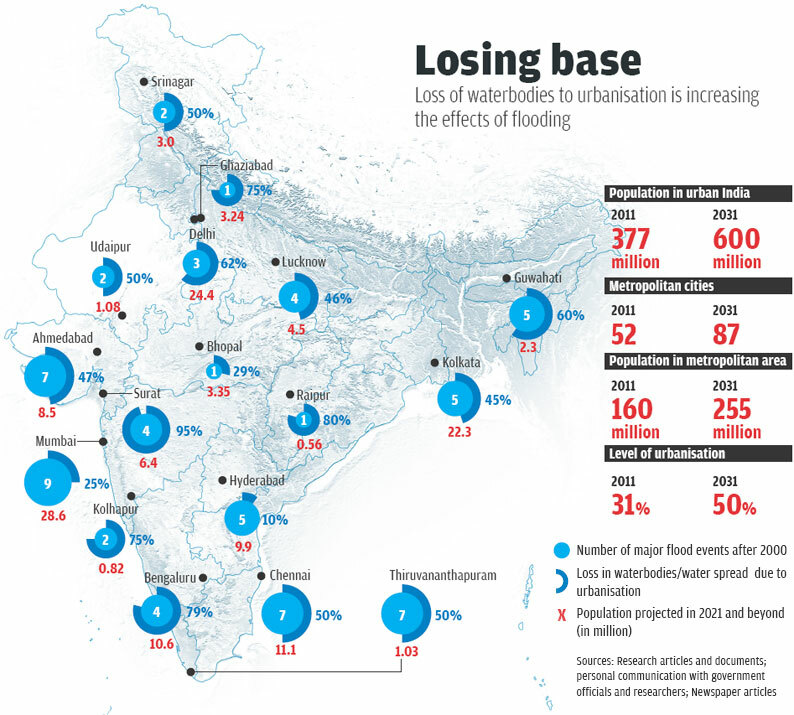 The floods repeatedly draw our attention to only one fact: our urban sprawls have not paid adequate attention to the natural water bodies that exist in them. A case in point is Chennai, where each of its lakes has a natural flood discharge channel which drains the spill over. But we have built over many of these water bodies, blocking the smooth flow of water. We have forgotten the art of drainage. We only see land for buildings, not for water. And the result is in front our eyes. An urban water body provides some crucial services such as groundwater recharge and flood management. If you ask the obvious question of how construction was permitted on the wetland, you will get a not-so-obvious response: wetlands are rarely recorded under municipal land laws, so nobody knows about them. Planners see only land, not water, and builders take over. 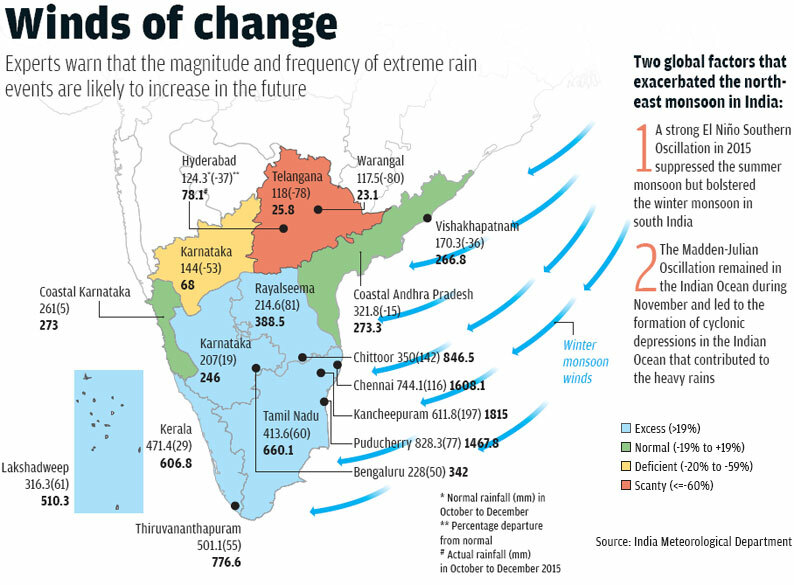 A number of cities including Chennai are both water-scarce as well as prone to flooding. Both problems are related—excessive construction which leads to poor recharge of groundwater aquifers and blocking of natural drainage systems. The city witnessed severe floods in 2015 when the entire city got completely submerged under water after it rained for a few days. Delhi-based non-profit Centre for Science and Environment’s research shows that Chennai had more than 600 water bodies in the 1980s, but a master plan published in 2008 said that only a fraction of the lakes could be found in a healthy condition. According to records of the state’s Water Resources Department, the area of 19 major lakes had shrunk from a total of 1,130 hectares (ha) in the 1980s to around 645 ha in the early 2000s, reducing their storage capacity. The drains that carry surplus water from tanks to other wetlands have also been encroached upon. So Chennai needs to do what all cities must—undertake a detailed survey of the wetlands and then bring every water body and its catchment under legal protection. The Wetlands Conservation and Management Rules issued by the Union Ministry of Environment and Forests and Climate Change are toothless and meaningless. What is needed is to ensure that city development rules include a comprehensive list of water bodies and their catchment. Any change of this land use should not be permitted. Even this will not be enough unless the city values the water this land gives. The Central government should provide funds for water supply to only those cities that have brought their own water sources under protection. The cities must show they have optimised local water potential before claiming access to water from far away sources. This will reduce the cost of supply. The city can invest the saved money in treating sewage, which pollutes the lakes and ponds in the first place. It is this vicious cycle that needs to be broken. It is time we realised that a water body is not an ornamental luxury or a wasted land. A city’s lake is its lifeline. Lakes and wetlands are an important part of urban ecosystem. They perform significant environmental, social and economic functions, ranging from being a source of drinking water, recharging groundwater to acting as sponges, supporting biodiversity and providing livelihoods. Their role becomes even more critical in today’s context when cities are facing the challenge of rapid unplanned urbanisation. Their numbers are declining rapidly. For example, in the 1960s Bangalore had 262 lakes, now only 10 hold water. Similarly, in 2001, 137 lakes were listed in Ahmedabad city, and construction work had started on 65 of them. Another example exhibiting this increasing loss of urban water bodies is Hyderabad. In the last 12 years, Hyderabad has lost 3,245 ha of its wetlands. The National Disaster Management Guidelines: Management of Urban Flooding report, published by the National Disaster Management Authority (ndma) in 2010, says that concretisation is a major problem in many cities and towns. According to the Union Ministry of Urban Development (MoUD), 31 per cent of the country was urbanised in 2011. The ministry says almost 50 per cent of the country will be urbanised by 2050. MoUD data also suggests a 54 per cent increase in the number of cities and towns between 2001 and 2011. Natural streams and watercourses, formed over thousands of years due to the forces of flowing water in the respective watersheds, have been altered because of urbanisaiton. “As a result of this, the flow of water has increased in proportion to the urbanisation of the watersheds. Ideally, the natural drains should have been widened to accommodate the higher flows of stormwater. But on the contrary, there have been large scale encroachments on the natural drains and the river flood plains. Consequently, the capacity of natural drains has decreased, resulting in flooding,” says the ndma report. Pollution: There has been an explosive increase in the urban population without corresponding expansion of civic facilities such as adequate infrastructure for the disposal of waste. Hence, as more people are migrating to cities, the urban civic services are becoming less adequate. As a result, almost all urban water bodies in India are suffering because of pollution. In many cases the water bodies have been turned into landfills. Guwahati’s Deepor beel, for example, is used by the municipal corporation to dump solid waste since 2006. Even the Pallikarni marshland in Chennai is used for solid waste dumping. Adding to the sorry state of urban water bodies is also the misuse of these water bodies by local communities for their cultural or religious festivals such the immersion of idols. Heavy metal concentration is found in Nagpur lakes, Bhopal lakes and Hussainsagar Lake in Hyderabad after the immersion of idols every year. Encroachment: This is another major threat to urban water bodies. As more people are migrating to cities, the availability of land is getting scarce. Today, even a small piece of land in urban areas has high economic value. Hence, these urban water bodies are no more acknowledged for their ecosystem services but as real estate. Charkop Lake in Maharashtra, Ousteri Lake in Puducherry, Deepor beel in Guwahati are well known examples of encroachment. Another interesting example of encroachment and pollution, not by some private builder but the government itself is Pallikarni marshland in Chennai. The size of this city wetland is decreasing rapidly. Once a bird sanctuary, it is now the dumping yard of the city. The dumping of solid waste, sewage discharge, and construction of new buildings such as a railway stations and a new road have shrunk this wetland to a great extend. Another example of government encroachment is Sola beel in Guwahati where the state revenue department allotted the lake bed for construction, in spite of Gauhati High Court’s order to protect all wetlands in the state. Illegal mining activities: Illegal mining for building material such as sand and quartzite both on the catchment and on the bed of the lake have extremely damaging impact on the water body. For example, the Jaisamand Lake in Jodhpur, once the only source of drinking water for the city, has been suffering from illegal mining in the catchment area for the last 20 years, despite a court order to stop mining in 1999. Badkhal Lake in Faridabad has dried up in the same way. Unmindful sand mining from the catchment of Vembanad Lake on the outskirts of Kochi has lowered the water level in the lake. Unplanned tourism activities: Using water bodies to attract tourists has become a threat to several urban lakes in India. Tso Morari and Pongsho lakes in Ladakh have become polluted because of unplanned and unregulated tourism. Another example is Ashtamudi Lake in Kaerala's Kollam city that has become polluted because of spillage of oil from motor boats. When the rains began in Jammu and Kashmir (J&K) on the morning of September 3, it was just another day for Vijay Gadhia. The 50-year-old employee of Jammu’s Power Development Department had gone to Srinagar with his colleagues for official work. He expected the next day to be bright and sunny. A day of rain in the region is usually followed by a day of sunshine. But the rain did not stop. Instead, he heard the news that a bus carrying 70 members of a wedding party was washed away by flash floods in Rajouri, of which 50 could not be traced. On the night of September 4, the Doodh Ganga, a tributary of the Jhelum flowing through Srinagar, breached its embankment following a cloudburst in its catchment area. On September 5, the water level in the Tawi and Chenab rivers in Jammu rose dramatically. Flood control bunds were washed away, bridges collapsed and agricultural land got submerged. Rains continued to lash the region in the next few days triggering landslides that disrupted highways and snapped power lines. Till the afternoon of September 5, Srinagar residents were clicking photographs of the gradually swelling Jhelum to post on social media. On the night of September 5, the Jhelum too breached its embankment at Padshahi Bagh, following which there was a half-hearted attempt by the state administration to warn the people. Announcements were made from several mosques in the city at 10 pm. Residents were asked to move to the first floor of their houses. But the announcements came late. Most people had gone to bed. Many of those who were awake ignored the words. According to Gadhia, it hardly sounded like a warning. Those who did not have a multi-storey building had no choice. By the time the announcements started, some parts of Srinagar were already submerged in waist-deep water. Gadhia and his colleagues sensed trouble and fled Srinagar, spent four days in the wilderness without food and water before reaching the Shankaracharya hill on September 12. “After that we reached the Governor House from where we were airlifted to Jammu,” Gadhia told Down To Earth. In September, rainfall in Srinagar crossed its 10-year-high mark—151.9 mm of rainfall in September 1992—within 24 hours. This year, the city received 156.7 mm of rainfall on September 5 alone. The average monthly rainfall for Srinagar is 56.4 mm. The India Meteorological Department recorded more than 500 mm of rainfall in the first week of September. 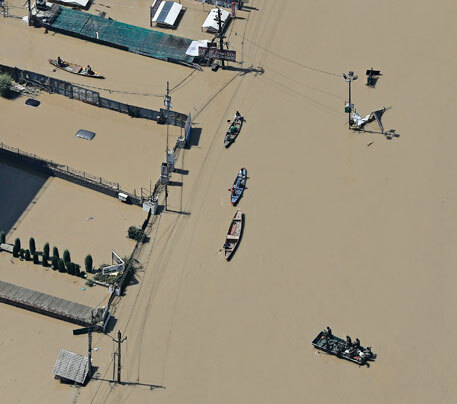 The floodwater started receding from September 11, but till September 13 more than 70 per cent of Srinagar was still submerged, with tens of thousands of people stranded. The two distinct water channels flowing through the city—the Jhelum and the flood channel, an artificial outlet created in 1904 to drain out excess water from the Jhelum in case of flood—had merged into a big, brown lake. Some of the worst-affected areas include Allochi Bagh, Tulsi Bagh, Wazir Bagh, Rajbagh, Zero Bridge and areas along the right bank of the Jhelum. Maisuma, Natipora, Lal Chowk and several localities in Civil Lines remained submerged under two metres of water. Murtaza Khan, a former legislator, spent three days on the roof of the MLA hostel building on M A Road. “The pace and level of rescue operation was only five per cent of the required scale. The Army or the National Disaster Response Force (NDRF) hardly knew about Srinagar. They had no idea which area was densely populated with kuccha houses and which had high-rises, nor did they know where the water currents were maximum and why,” he says. 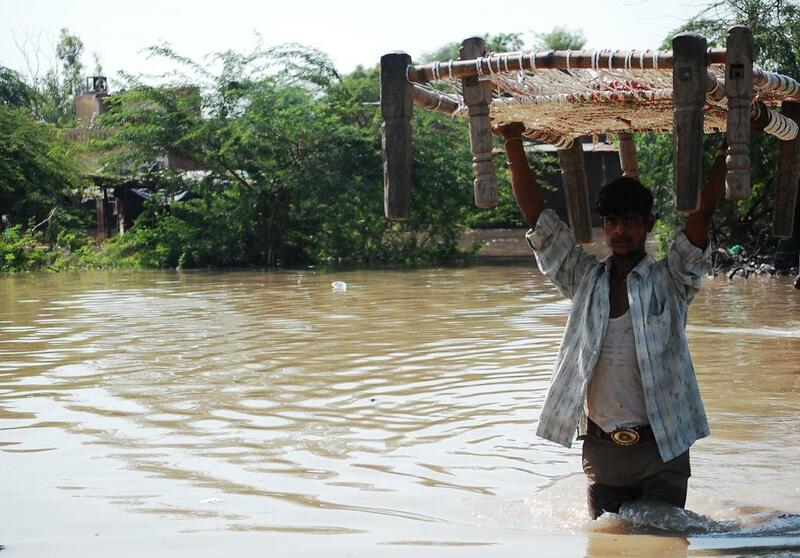 Gadhia and Khan were lucky to have been saved, unlike the 215 people who lost their lives in the deluge. The toll is likely to rise as the water recedes. Hectares of ripe crop and orchards have been lost, and the infrastructural damage is likely to cross Rs 6,000 crore. Kashmiris have complained about the lack of coordination among the Army, NDRF and the local administration in rescuing people. Chief Minister Omar Abdullah pleaded helplessness. “I had no government for the first 36 hours as the seat of establishment was wiped out. My own residence has no power supply, and my cellphones had no connectivity. My capital city [Srinagar] was taken out. I resumed administrative operations with six officers in a makeshift mini secretariat,” he told journalists at a press meet on September 9. According to news reports, the six-storey secretariat was submerged up to the second floor. Abdullah added that his officers could not be located for at least three days after the floods began. “People’s anger is justified, but we were caught off guard.” His minister for irrigation and flood control, Shyam Lal Sharma, told Down To Earth that his department had given a warning which was not taken seriously. “We issued a warning on September 5. People were alerted in various parts of the state,” Sharma said. Jammu and Kashmir has a long history of floods. From 1905 to 1959, the state was hit by flood 14 times. 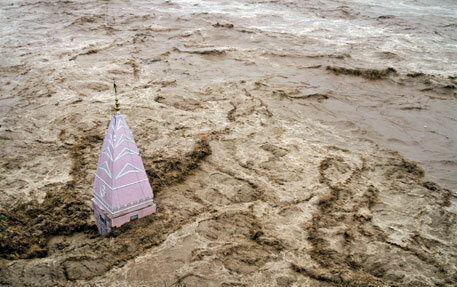 The memory of the 2010 floods in Leh was still fresh when disaster struck again last month. 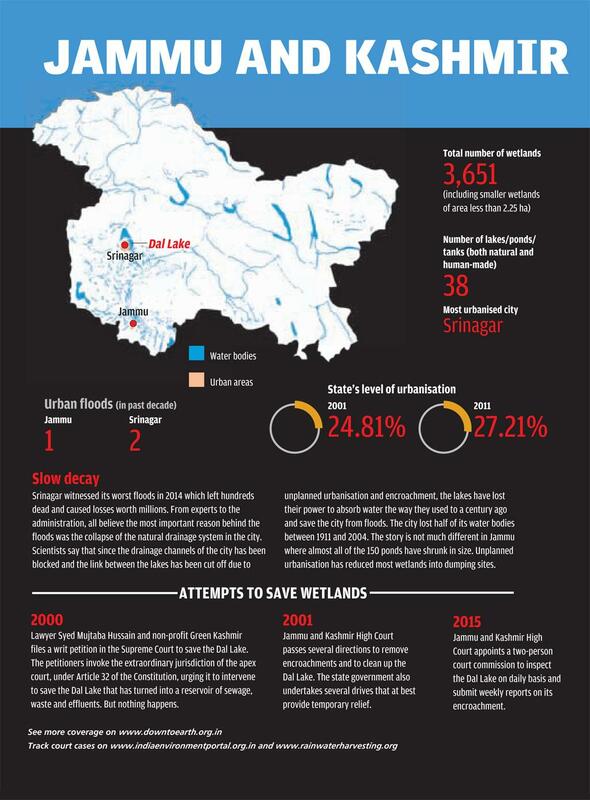 In 2010, the Jammu and Kashmir Flood Control Ministry had prepared a report and issued a warning that the state is likely to face a major flood catastrophe in the next five years and that the government is ill-equipped to save lives and property. The Irrigation and Flood Control Department had proposed a Rs 2,200 crore project to put the required infrastructure in place. The report was submitted to the Union Water Resources Ministry, but nothing happened. The Jhelum is one of the most important natural drainage channels of Srinagar, which is otherwise like a bowl having no outlet for water. Silt has accumulated in all of its major tributaries and the flood channels are blocked. The wetlands of Nadru, Nambal, Narkara Nambal and Hokarsar that absorb rainwater have been replaced by residential colonies (see ‘Srinagar’s lost saviours’). Whenitrains for two to three days, the city gets flooded with water from the Jhelum. “Srinagar faces flood every 50 years. It has a cycle. But encroachment has killed its flood channels. Bemina used to be a flood basin, but many residential and commercial buildings have come up in its place in the past 10 years,” Sharma says. The entire city of Srinagar was flooded after Jammu and Kashmir received more than 550 mm of rainfall in one week. Would the city have faced the same catastrophe had its wetlands and other water bodies been in good shape? Srinagar was once famous for its traditional ponds and tanks, which have been erased to house commercial complexes and parks. This has become a widespread practice across India. Every year floods are reported from cities like Ahmedabad, Bhopal, Bengaluru, Kolkata, Mumbai, Chennai, Hyderabad, Surat, Rohtak, Gorakhpur and Guwahati. Factors are many—inadequate drainage systems, constructions on flood plains and river beds and loss of natural water storage areas. It only shows how rapid urbanisation in and around a city makes floods inevitable. In the past decade alone, India witnessed numerous incidents of floods in Mumbai (nine times), Ahmedabad (seven times), Chennai (six times), Hyderabad (five times), Kolkata (five times), Bengaluru (four times) and Surat (thrice). Abdullah defended himself by saying that state capitals had never been hit by a disaster in recent memory. But the devastating flood could have been averted had his administration and the Union government taken necessary steps to save the drainage channels of Srinagar when an alert was sounded in 2010. In flood-ravaged Jammu and Kashmir, the streets of the state’s summer capital, Srinagar, resemble surging streams. The drainage channels of the city have been blocked. The links connecting the lakes have been cut off due to unplanned urbanisation and encroachment. As a result, the lakes have lost their capacity to absorb water the way they used to a century ago, scientists say. Wetlands and lakes act as sponges during floods. Kashmir Valley is dotted with wetlands. Apart from natural ponds and lakes, the valley has other types of wetlands, such as rivers, streams, riverine wetlands, human-made ponds and tanks. According to a report by the Department of Environment and Remote Sensing, there are 1,230 lakes and water bodies in the state—150 in Jammu, 415 in Kashmir and 665 in Ladakh. Dal Lake, Anchar Lake, Manasbal Lake and Wular Lake are some of the larger wetlands in the region which are today threatened by urbanisation. Dal Lake in Srinagar, one of the world’s largest natural lakes, covered an area of 75 square kilometre in 1,200 AD, says Nadeem Qadri, executive director of the non-profit, Centre for Environment and Law. The lake area almost reduced to one-third in the 1980s and has further reduced to one-sixth of its original size in the recent past. It has lost almost 12 metres of depth. Srinagar’s natural drainage system has collapsed making it prone to urban floods. Last month, continuous rain for two to three days flooded Srinagar with water from the Jhelum. This would not have happened a few decades ago, say Humayun Rashid and Gowhar Naseem of the Directorate of Ecology, Environment and Remote Sensing, who have studied the loss of lakes and wetlands in Srinagar and its effect on the city. They explain that deforestation in the Jhelum basin has led to excessive siltation in most of the lakes and water bodies of Srinagar. They compare two maps of the city—one of 1911 and another of 2004 (see ‘Srinagar’s lost saviours’). Their analysis shows that wetlands like Batamaloo Nambal, Rekh-i-Gandakshah, Rakh-i-Arat and Rakh-i-Khan and the streams of the Doodh Ganga and Mar Nalla have been completely lost to urbanisation, while other lakes and wetlands have experienced considerable shrinkage in the past century. 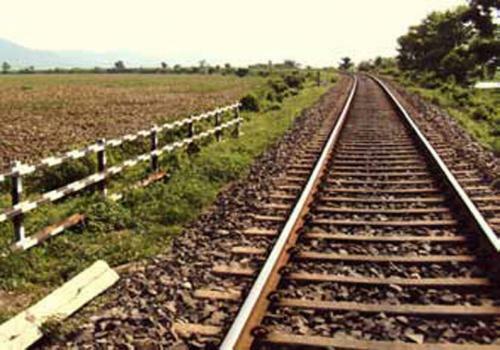 The study involved mapping of nearly 69,677 hectares (ha) in and around Srinagar. The analysis of the changes that have taken place in the spatial extent of lakes and wetlands from 1911-2004 reveals that the city has lost more than 50 per cent of its water bodies. When some low-lying areas in Srinagar go under water during heavy rains, people blame the drainage system. What they don’t realise is that they have constructed their houses in those low-lying areas that were previously used as drainage basins for the disposal of storm water, says Mehrajudin Bhat, executive engineer of the J&K Urban Environment Engineering Department. “People in the city have connected their sewage lines directly to drains that are meant for the disposal of storm water. This leads to choking of drains,” he explains. In 1971, Srinagar’s municipal limits covered only 83 square kilometres (sq km). In 1981, the area went up to 103.3 sq km. 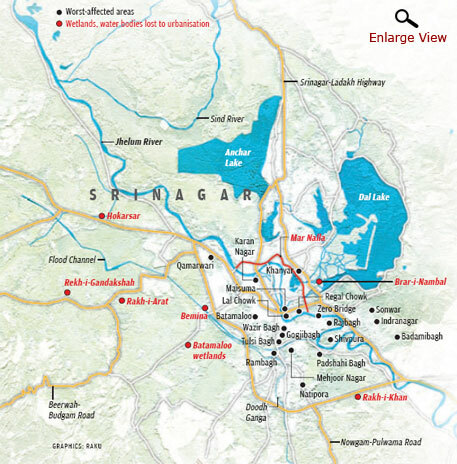 At present, urban agglomeration of Srinagar covers more than 230 sq km. This has resulted in the encroachment of wetlands and natural drainage channels, Bhat says. Just like Srinagar, many urban centres of India have failed to manage their drainage channels and storm water drains. Mumbai learnt its lesson in July 2005. The six basins of streams that criss-crossed the city, meant to carry its monsoon runoff, had been converted into roads, buildings and slums, just like Srinagar. Kolkata, Guwahati, Hyderabad, Chennai and several other cities have been falling prey to frequent urban floods due to the degradation of their drainage network. A few cities like Guwahati and Kolkata have taken steps to preserve their water bodies. In Guwahati, the state government passed the Guwahati Water Bodies (Preservation and Conservation) Act, 2008. The aim was to preserve wetlands and to reacquire land in the periphery of the water bodies. In 2006, the East Kolkata Wetland Conservation and Management Bill was passed to protect 12,000 ha of wetland. The Ministry of Environment and Forests issued a rule for conservation and management of wetlands in December 2010, under the provisions of the Environment (Protection) Act, 1986, called the Wetlands (Management and Conservation) Rules, 2010. But the law has no teeth until a wetland is notified under it, says leading environmental lawyer Sanjay Upadhyay. He adds that the Town and Country Planning Act should take care of the wetlands, but the municipal bodies that implement this Act do not have the technical expertise to even identify a wetland. These loopholes add to the problem of floods in urban India. Six kilometres below, Rambara village is a resting point for devotees going to Kedarnath Temple. 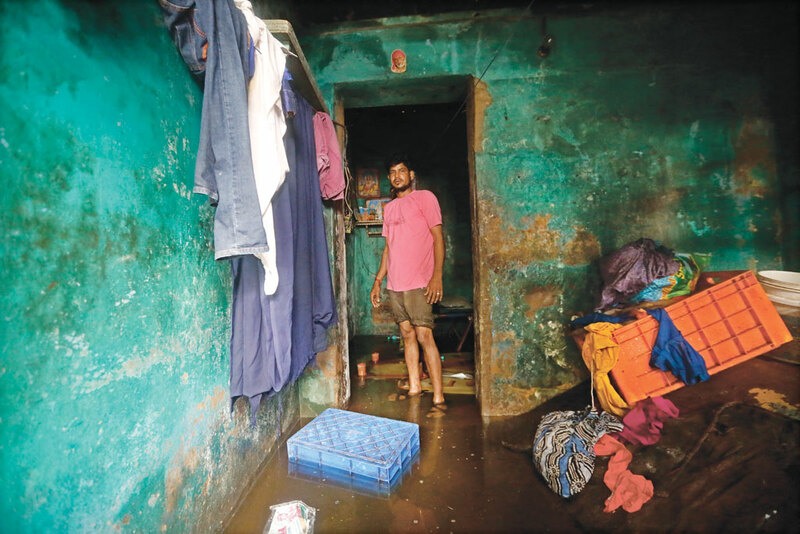 Its 43-year-old resident Sankar Gosai shudders to recount the sight of the enormous amount of water gushing down the mountain. In no time, long stretches of a road and houses were swept away. “It had been raining nonstop since June 14. Fearing flood, we had climbed up the hill. But we never imagined that such a huge amount of water could swoop down all so suddenly,” he says. Gosai walked down the precarious mountain for two full days till he reached Rudraprayag town. Rakesh Singh, 36, had a miraculous escape because he clim bed the temple roof. He came to Kedarnath with 12 family members. He does not know where the others are. It all started at Chorabari glacier, say people who have managed to return. The glacier lies on the slope of the 6,940- metre Kedarnath peak of the Himalaya. The glacier is 7 km in length, its basin area is 38 sq km and the ice cover is 5.9 sq km. It has two snouts—one is the source of the Mandakini (at 3,865 metres) and the other becomes the Chorabari Lake (at 3,835 metres). People recall that on June 16 the lake exploded when clouds burst over it. The lake is 6 km from the temple upstream the Alaknanda. Ensuing rains cut off the hilly districts of Uttar kashi, Rudraprayag, Chamoli and Pith oragarh from the mainland and battered the land till it crumbled. Pithoragarh faced the disaster twice—on June 16 and on June 22, says Naresh Ram, resident of Kholi village. “I have never seen anything like this. It was as if someone was throwing water from under the ground,” says Vivek Rawat, 27, who worked at a hotel in Gaurikund, about 15 km from Kedarnath. Almost everything in Gaurikund is demolished, he says. Eyewitnesses have similar stories from Kedarnath Temple and Hemkunt Sahib. Nobody is yet sure of the reason. On June 18, Sushil Singh, resident of Mirzapur, Uttar Pradesh, ran down from Gaurikund to Gaurigaon to save his life. There is no trace of the 14 people he came with, he says. Around 5,000 people like him reached the village. But most were ill. They had swallowed mud that had flowed with the water. Many died of it at Gaurigaon. The rest waited beside the bodies, to be rescued. On June 19, as the army was battling against time to rescue people, there was utter chaos in the administration. Bureaucrats, sitting inside expensive hotels, were screaming on their mobile phones. At the Rudraprayag police control room, no one knew what action to take. It took Home Minister Sushil Kumar Shinde to come down to Uttarakhand to admit that there was no coordination among government agencies, which was hampering rescue operations. The only piece of information that seemed to make sense was an 11-page report that the district information officer was quoting to journalists. The report, prepared by the State Disaster Management Control Room in Dehradun, gave an assessment of the scale of the disaster. At 5 pm, Rudraprayag town welcomed the first batch of people from Badrinath, Govindghat, Pandukeshwar and Gaurikund who came in 11 vehicles. The Army and the state government had managed to link the upper hills to the town. As the buses and private taxis stopped, people ran towards water, food stalls and the medical desk where the Rudraprayag Vyapar Mandal had organised free service for victims. Akhilesh Srivastava of Jhansi wept on seeing food. His family was stranded at Hemkunt Sahib near the Valley of Flowers. Army personnel helped them walk down to Govindghat in Chamoli district, from where they were taken to Joshimath. They trekked till Rudraprayag because they had run out of money. “Private taxis were charging double the fare and the private helicopters were demanding Rs50,000 per person to reach us to safety,” he says. During the trek, they sucked their wet clothes when thirsty. His six-year-old son chewed grass in the night when he could not withstand hunger pangs. On June 20, when Down To Earth reached Kedarnath, it was clear that the State Disaster Management Control Room had presented only 10 per cent of the real picture. The temple town was stinking of rotting bodies. The ground level had risen by about two metres and bodies could be seen stuck in the debris at about every 10 metres. The lanes were strewn with crumbled tin sheets and broken pieces of wood. “Kedarnath is now haunted,” says Rakesh Singh, waiting at Rudraprayag to be airlifted by an Army sortie. Every year, Uttarakhand’s Garhwal region receives pilgrims in thousands for Chhota Char Dham yatra—Gangotri, Yamunotri, Kedarnath and Badrinath. It also receives heavy rains and suffers floods. But the loss the region has suffered this time is horrifying. According to the Char Dham control room records, there were 26,000 people in Kedar Valley on June 16. This is where the temple is located. Records also show that 39,000 people had left the valley that day for Badrinath, Gangotri, Yamunotri and Hemkunt Sahib. The government’s figure of about 800 total deaths is too conservative. The number, clearly, is in many thousands. The raging Bhagirathi, Alaknanda and Mandakini have swollen like never before and swept away whatever came in their way. As many as 2,052 houses have been wiped out, 147 bridges have collapsed and 1,307 roads destroyed, says Rakesh Sharma, state infrastructure development commissioner. The upper reaches of Uttarakhand look as if the region has travelled a hundred years back in time. The Gangotri and Yamunotri highways are damaged at several places. The rivers have damaged the 36-km stretch from Uttarkashi to Bhatwari at six places. 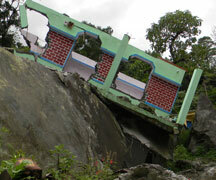 Higher up, roads are damaged due to landslides. “The stretch of road between Matli to Maneri in Uttarkashi is so badly damaged that one cannot tell when it can be repaired,” says Sharma. Three drinking water projects have got washed away in Garur block, while 71 streams and 40 canals have been damaged. As per preliminary estimates, says Sharma, the disaster has cost Uttarakhand Rs 50,000 crore in infrastructural loss. Uttarakhand Jal Vidyut Nigam Limited has suffered loss of Rs 77 crore apart from the Rs50 crore lost in power generation. Near Silli village, 17 km from Rudraprayag, the Mandakini has shifted course and washed away all the structures along its banks, says Prakash Thapliyal, who lost his house. “The river shifted course because of Larsen and Toubro’s Singholi-Bhatwari hydropower project. All the debris was dumped on the riverbed,” he says. 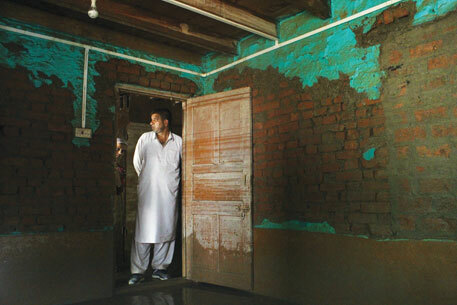 In Srinagar, the training centre of Sashastra Seema Bal was damaged apart from several houses in low-lying areas. “The deluge was the result of the dam at Srinagar. Its floodgates were opened without warning. The water carried all the debris at the dam site and brought it here,” says resident Arun Negi. In August 2012, when flash floods occurred in Uttarkashi, the Uttarakhand Disaster Mitigation and Management Centre had recommended strict regulation of developmental initiatives near streams and rivers. No heed was paid to it. In Rudraprayag, no structure is allowed within 100 metres from the river’s banks. The flood widened the river’s course by 15 metres and caused damage worth crores of rupees. “What else does one expect from the mountain if there is heavy tourist rush at vulnerable areas. The Himalaya is a young mountain and you dynamite it to build roads. Landslides are bound to happen,” says Anand Sharma, executive director of Dehradun Meteorological Centre. Read more to know what should be the development strategy for this region. 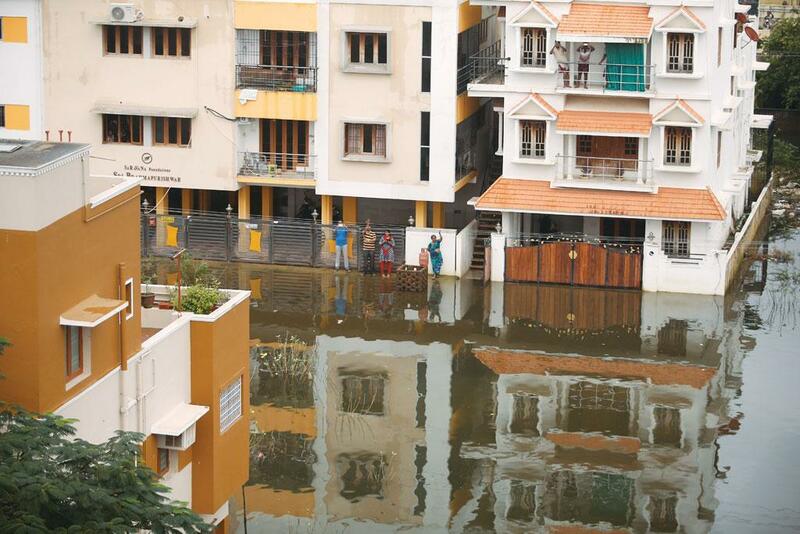 Know how far your city has managed to save wetlands and how prone is it to floods. Uttarakhand floods: is the disaster human-induced? Why are our cities becoming more flood prone? The immediate and perhaps workable strategy would be to properly demarcate and geo-reference ALL wetlands, marshes, lakes, river banks and seasonal drainage channels in and around cities and then to notify these as PROTECTED FORESTS. Any tinkering with them will invoke provisions of the Forest Conservation Act, 1980 which is the one legal instrument, backed by the judiciary, that has saved many forests, grasslands, alpine pastures and Protected Areas. Why can't it be used to protected wetlands within cities?